The North Rhine-Westphalian Local Authorities Confederation (back then operating under this name) started work on 1 January 1971. It was created by merging the preceding organisations: Rhine Local Authorities Assembly, Westphalia-Lippe Local Authorities Confederation and North Rhine-Westphalia Association of Towns and Cities. An “hour of birth” for the North Rhine-Westphalia Local Authorities Confederation can no longer be discerned with hindsight. Not least because the state of North Rhine-Westphalia is a comparatively young one, and in this part of Germany other political entities have also preceded it: the German Empire, the Kingdom of Prussia, the Weimar Republic, the state of Prussia, and the National Socialist Third Reich. The beginnings of municipal self-organisation in the German Empire date from 1871. For the municipalities in the Rhineland, the Rhine Association of Towns and Cities held conferences as from 1887. In 1896, a provincial local authorities assembly was constituted in Prussia – back then the governmental entity ruling the Rhineland and Westphalia. In 1908, the Rhine Association of Towns and Cities was formed in Coblenz, for municipalities with more than 15,000 inhabitants. A pan-German representative body was not formed until 1905, in the shape of the German Association of Towns and Cities, and in 1910 in the shape of the Imperial Association of German Towns and Cities, a spin-off from the German Assembly of Towns and Cities, this time involving smaller municipalities. In the Weimar Republic (1918 - 1933) there was a broad spectrum of municipal representative organisations on the regional, state and national levels, in the shape of the Prussian Association of Rural Local Authorities West (from 1920), the Imperial Association of German Rural Local Authorities (from 1922) and the Imperial Association of Towns and Cities (formerly the Imperial Association of German Towns and Cities). The National Socialists put an end to this in 1933 by compulsorily amalgamating all German municipal umbrella organisations to form the German Local Authorities Assembly. After the 2nd World War, political life re-awakened first in the municipalities. In view of the segmentation imposed by the zones of occupation, mutual feedback between towns and municipalities was restricted to the immediate neighbourhood and the surrounding region involved. Nevertheless, in the late autumn of 1945, Joseph Breuer, an ex-Mayor of Essen-Werden, was already calling for the foundation of a new German Association of Towns and Cities. This received a work permit from the British military government in July 1946 – one month before the establishment of the state of North Rhine-Westphalia. In the subsequent months, the larger county-affiliated towns in the Rhineland and in Westphalia joined forces to form a North Rhine-Westphalian subsection of the German Association of Towns and Cities. This state organisation remained an autonomous lobbying group till the beginning of 1971. The smaller county-affiliated councils and agencies also re-organised themselves. In January 1947, the North Rhine Rural Local Authorities Assembly was set up. The same month saw the foundation of the Westphalia Local Authorities Assembly, which shortly afterwards took over representation of the municipalities in Lippe. Both organisations were keen to amalgamate, but because of personal differences between the senior officers involved this did not materialise until July 1967. The Westphalia-Lippe Local Authorities Assembly accordingly built an office for its sole use in 1962 in Düsseldorf’s Cecilienallee. The building is still owned by the North Rhine-Westphalia Local Authorities Confederation accommodating organisations like the NRW Municipal Agency (KommunalAgentur NRW GmbH). The home of the umbrella organisation for county-affiliated towns and municipalities in North Rhine-Westphalia was as from January 1971 the building occupied by the North Rhine-Westphalia Local Authorities Confederation, which the latter had built in 1969 in Kaiserswerther Strasse in the north of Düsseldorf. 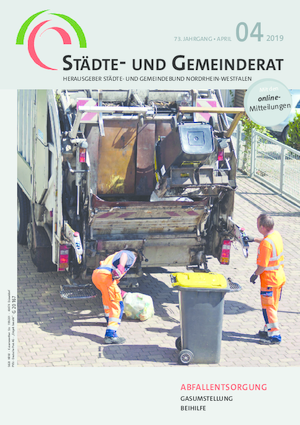 The municipal organisations in NRW have several times offered their federal counterparts a home. In 1950, for example, the newly founded German Local Authorities Assembly maintained a shared office in Düsseldorf together with the North Rhine Local Authorities Assembly, an arrangement not separated until 1960, as the remits involved increased. The German Local Authorities Confederation, created in 1973 by merging the Association of Towns and Cities and the German Local Authorities Assembly, also took up residence with the North Rhine-Westphalia Local Authorities Confederation in Düsseldorf. Department heads, deputy directors and managers worked for both organisations on a personal union basis. Only when the German parliament and the federal government moved from Bonn to Berlin was the shared office discontinued. Since January 1998, the German Local Authorities Confederation has maintained a central office of its own in the federal capital, plus branch offices in Bonn and Brussels. The North Rhine-Westphalia Local Authorities Confederation, operating under this name since 2000, has since then been using the office in Düsseldorf alone. The Düsseldorf office of the North Rhine-Westphalia Local Authorities Confederation shortly after its inauguration in 1969, back then still housing the North Rhine-Westphalia Association of Local Authorities. Until the end of 1997, the building in Kaiserswerther Strasse also housed the joint office of the German Local Authorities Confederation and the North Rhine-Westphalia Local Authorities Confederation.